WP Fusion works with WooCommerce subscriptions to allow you to automatically tag your subscribers at purchase, as well with a variety of other triggers. 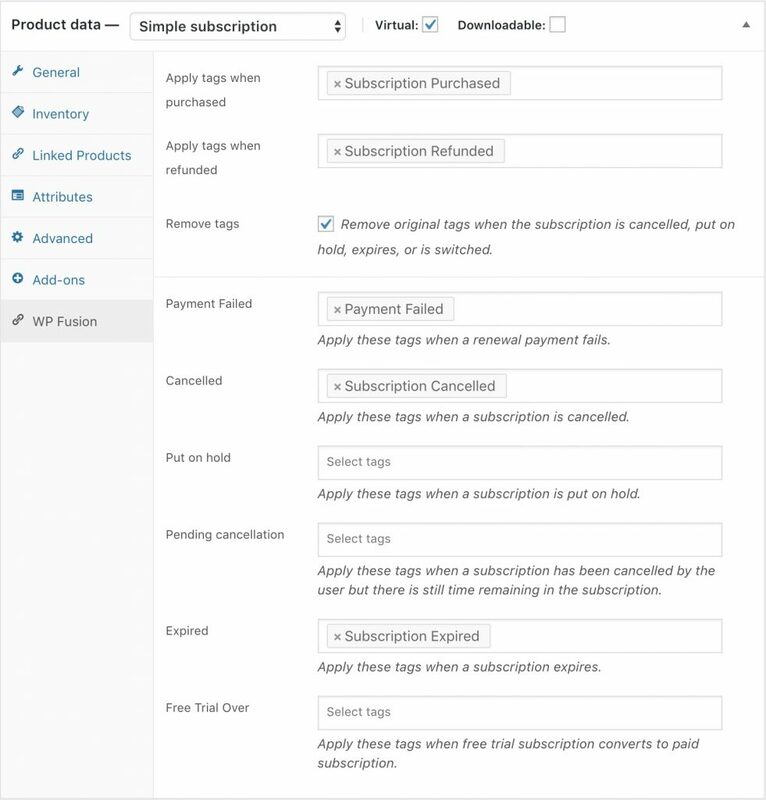 For each subscription product, you can configure a variety of parameters, such as removing purchase tags when the subscription is cancelled, or when a payment fails. You can also apply additional tags based on a change in the subscription state, allowing you to trigger followup sequences in your CRM when customers’ subscriptions are cancelled, put on hold, or expire. Note: For tracking failed payments it’s preferable to use the “Payment Failed” setting instead of “Put on hold”, since subscriptions will temporarily be put on hold as part of the renewal process. WP Fusion also lets you sync certain details about a customer’s active subscription to custom fields on their contact record. To set this up, navigate to Settings » WP Fusion » Contact Fields, and scroll down to the WooCommerce Subscriptions section. Here you can configure custom fields to store the subscription product name, subscription start date, and subscription renewal date. Note that this is not very effective on sites where customers can have more than one active subscription, since the values will continue to be overwritten.